Chiang Mai is one of the top destinations in a country that is one of the most visited in the world. Including domestic tourists, 10 million people visit Chiang Mai every year! 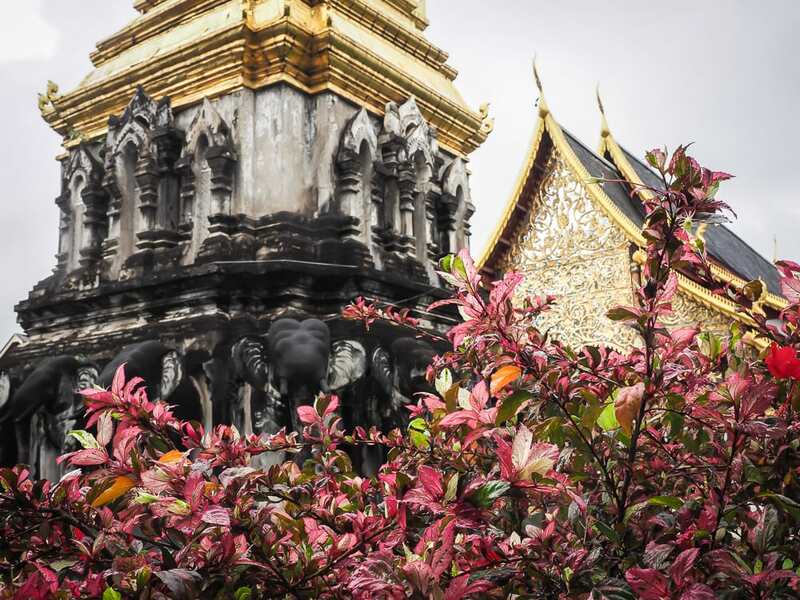 The amazing assortment of temples in Chiang Mai, along with the city’s bustling markets, mouth-numbingly delicious Lanna cuisine, and easy-going urban atmosphere, are the reason all these tourists come here. Still, I wasn’t really satisfied with any of the Chiang Mai temple listicles out there when I was planning my most recent trip to Thailand. They were either not comprehensive enough, or overloaded with historical details. That’s why I made it my mission during my 10-day stay in Chiang Mai to put together this simple yet comprehensive guide; essentially, I will dumb it down to the must-know details, and tell you what made each of the must-visit temples in Chiang Mai special to me. 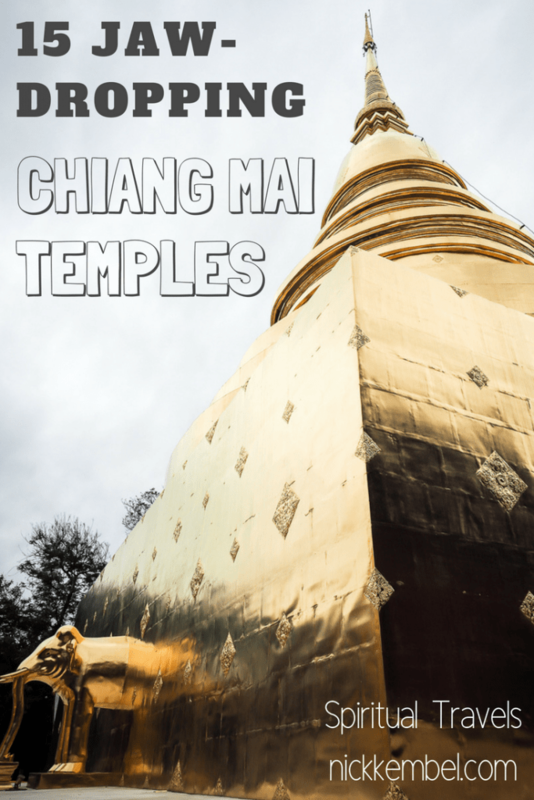 Hopefully, this will help you decide which ones to include on your Chiang Mai itinerary when you are planning your trip to Chiang Mai and Thailand itinerary! 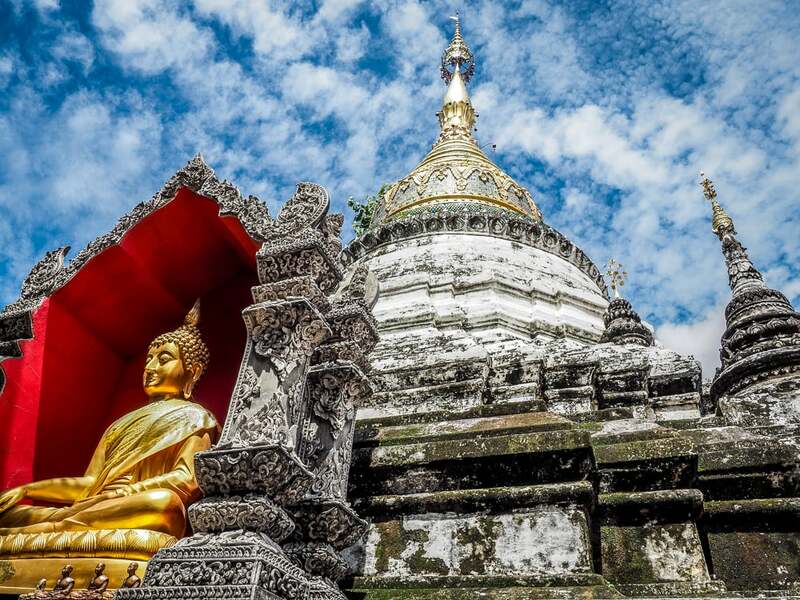 If you’d prefer to visit with a local expert, then check out this highly recommended Chiang Mai temple tour or this mindful temple tour which includes meditation. You can get 100 baht off either tour if you sign up for Klook here first! 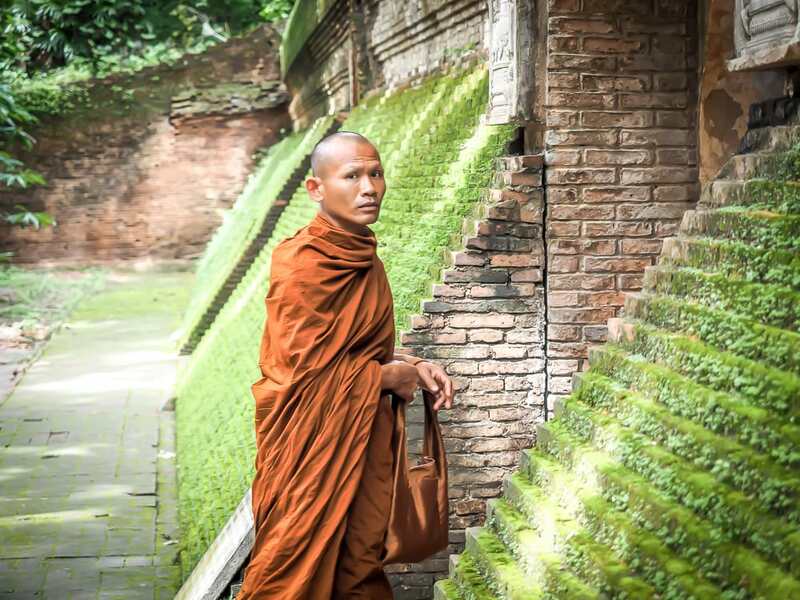 For a break from all the temple hopping, there are many other things to do in Chiang Mai. Check out Chiang Mai’s Grand Canyon, or this umbrella village 10 kilometers out of town. Further afield, if you are interested in doing meditation, you can head northwest of Chiang Mai to do a Vipassana meditation course at Wat Pa Tham Wua Forest Monastery. 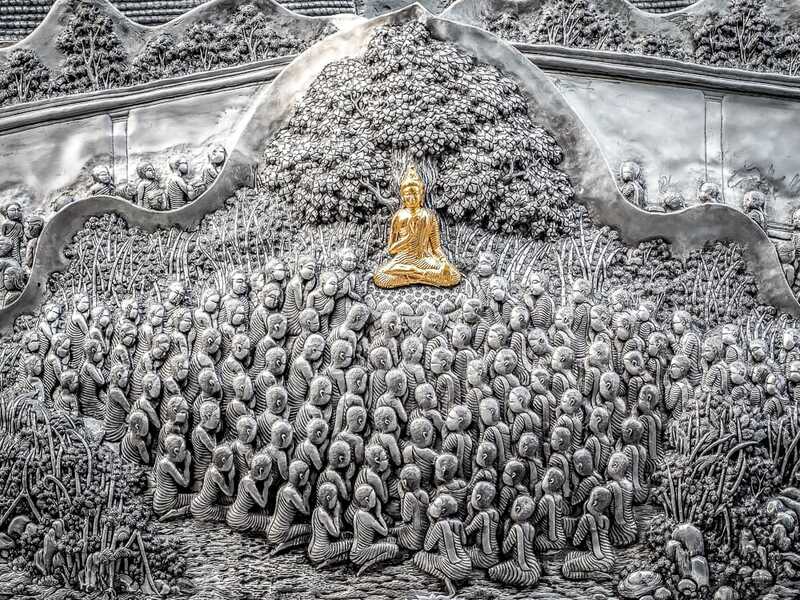 Last but not least, you should consider hopping on a day trip to Chiang Rai or chartering a private vehicle to see the incredible Chiang Rai White Temple. Wat Phra Singh is the most popular temple in Chiang Mai by visitor numbers. Mainly this is because it houses the city’s most important Buddha image, the Lion Buddha, which you can see in a small chapel at the rear of the complex, next to the golden chedi. It dates back to 1345, when Chiang Mai was the capital of a growing Lanna Kingdom in what is now Northern Thailand. Wat Phra Singh is included on the Chiang Mai Temple Tour. Besides its importance for housing the Lion Buddha, the temple complex is overall a gorgeous example of classic Lanna-style temple architecture. 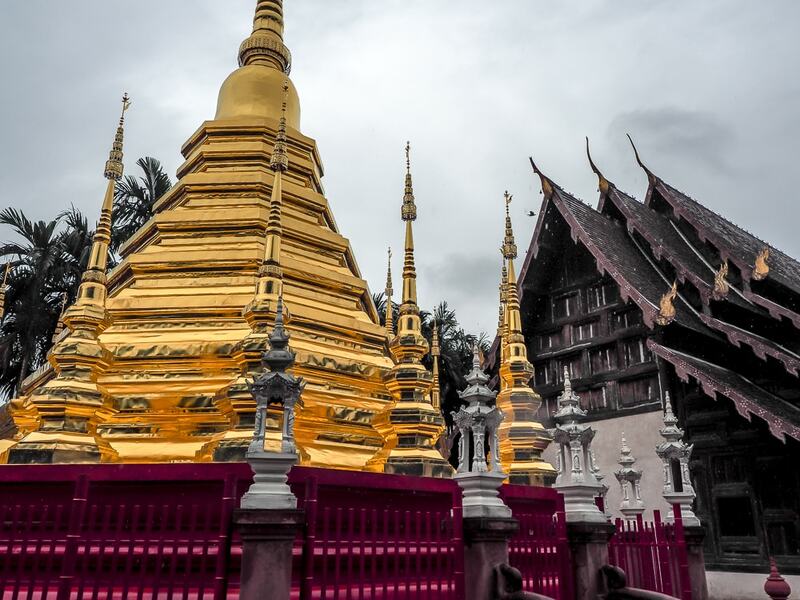 It seemed to me like the epitome of the style that you see in many other Chiang Mai and Northern Thai temples, and the golden chedi is especially vibrant and striking. One unusual thing that was impossible to ignore was the group of elderly meditating monk models in the main viharn (assembly hall), Lai Kham. They look so real that I was entirely fooled, avoiding staring at or bothering them until I got right up to them. Even up close, fine details such as nose and ear hairs had me second guessing myself. I can’t deny that it was a little creepy. The temple complex is located on the west side of the Old City, at the western end of Ratchadamnoen Rd., the main east-to-west roadway in the Old City, which becomes a popular walking street/night market every Sunday evening. Due to its location, we found it to be the perfect starting point for walking tour of Chiang Mai’s Old City temples. 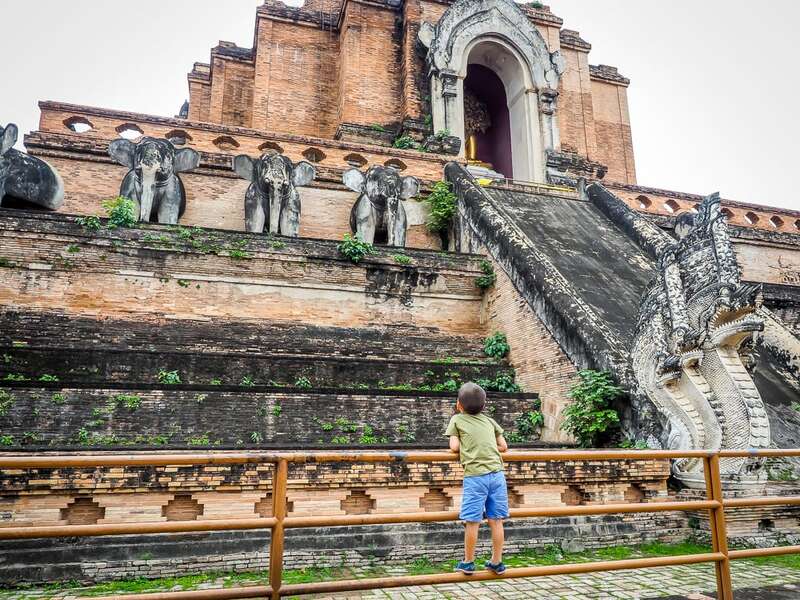 Perhaps the second most popular temple in the Old City, Wat Chedi Luang was one of Chiang Mai’s tallest structures at the peak of the Lanna Kingdom. Dating to 1441, it was likely damaged by an earthquake in 1545 and by cannon fire when the city was being retaken from the Burmese in 1775. It once housed the jade Phra Kaew (Emerald Buddha), Thailand’s most important Buddha image, now housed within the Grand Palace in Bangkok. Today there is a replica in its place in one of the chedi’s alcoves. Wat Chedi Luang is included on the Chiang Mai Temple Tour. While many ancient Chiang Mai temples have been continuously rebuilt or maintained so they don’t actually look that old, Wat Chedi Luang’s massive, damaged chedi looks like proper ruins, so it feels the oldest. I especially liked the stone nagas flanking the staircases going up all four sides of the chedi. Sitting nearly at the center of the Old City, Wat Chedi Luang is a 5-10 minute walk east from Wat Phra Singh along Ratchadamnoen Rd. Turn right on Prapokkloa Rd. and go past Wat Phan Tao (#3 below) to find the entrance. 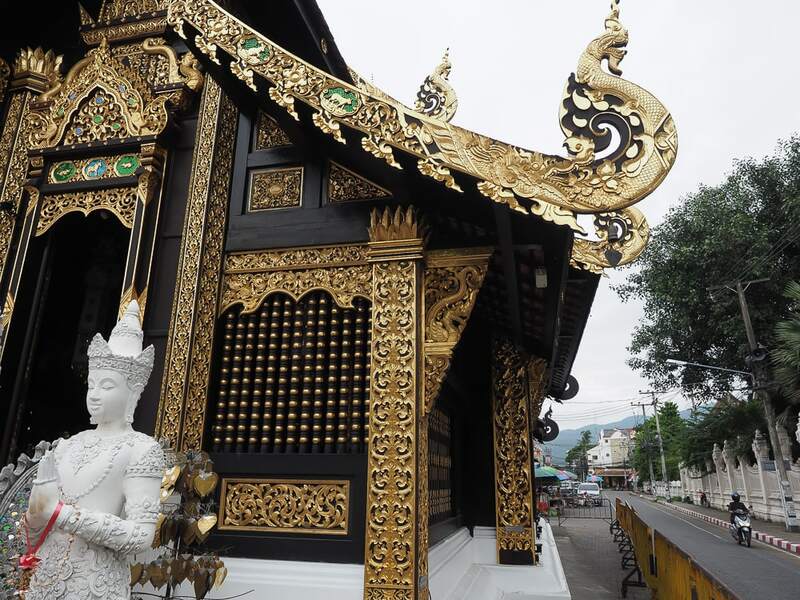 The main feature at this small temple complex is an assembly hall made almost entirely of teak wood that was once a throne hall for one Chiang Mai’s kings. It’s nearly as old as the last two entries, and contains large teak pillars, naga bargeboards, and mirror mosaics. There is a gold-covered chedi behind it. I liked it because the wooden style made it different than the others. It was compact and humble, and I liked how you have to duck under a low gate to enter from the street. I wouldn’t say it’s an absolute must-see temple in Chiang Mai, but since it is located right beside Wat Chedi Luang (#2), it would be silly not to stop in for a quick look. The temple is right beside Wat Chedi Luang, just south of the intersection of Ratchadamnoen and Prapokkloa roads. Even if you aren’t a history buff, it’s cool to know it’s the oldest in town, and I thought the dark grey elephants around the base of the chedi, contrasted with the shiny, golden top, made it look powerful yet elegant. 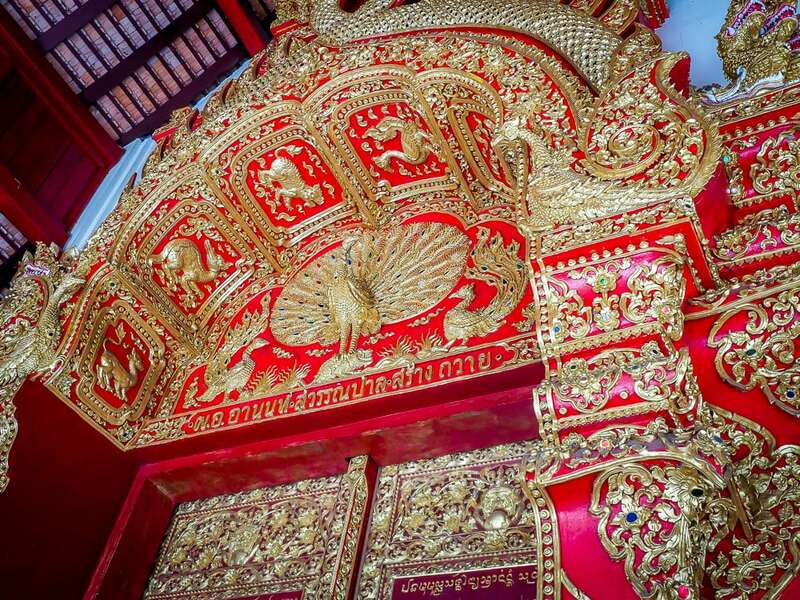 There are also some gorgeous red and gold murals which were stenciled inside the large chapel on site in 1996 to commemorate the 700-year anniversary of the founding of Chiang Mai. The temple is located in the northeastern corner of the Old City on Ratchaphakhinai Rd. If you’re walking up this way from Ratchadamnoen (the Old City’s main street), it makes sense to see Wat U Mong (#5) and Wat Inthakin (#6) on the way, and continue on to Wat Chiang Yeun (#7) and Wat Ku Tao (#8) north of the Old City wall if you’ve got more time. Meditation huts and a niche in a brick stupa where monks used to meditate. Not to be confused with the more impressive forest temple Wat U Mong (#13) in the southwest of Chiang Mai, this temple & meditation center is famous for a niche in one of its brick stupas in which monks used to meditate. Like the more famous and much larger Wat U Mong, Wat U Mong Mahathera Chan has an enclosed, forested feel to it, albeit on a much smaller scale. There isn’t much to see and it won’t blow you away, but it’s worth taking a stroll through it and the connecting alley (Phra Pok Klao alley 12), a perfect example of the kind of calm, leafy lanes that give the Chiang Mai’s Old City its charm. The main entrance is on Ratchaphakhinai Rd., with the back entrance connecting to Phra Pok Klao alley 12. You can follow Phra Pok Klao alley 12 to Inthawarorot Rd., where you’ll find Wat Inthakin (#6 below). Also called the “city navel temple,” Wat Inthakin dates to the founding of the city and marks the spot where a pillar once stood at the ancient city center. The pillar was later moved to Wat Chedi Luang (#2). The signature black assembly hall is actually a recent addition to the historical chedis and other buildings further in from the road. History aside, I liked the unusual location so close to Inthawarorot Rd. that cars drive by within meters of its outer wall, and the black and gold exterior is alluring. It makes sense to walk along Phra Pok Klao alley 12 and Inthawarorot Rd. from Wat U Mong Mahathera (#5) to get here as a detour when heading north to visit Wat Chiang Man (#4). The exact founding date is unknown, but this temple goes way back and was very important during the Lanna Kingdom. 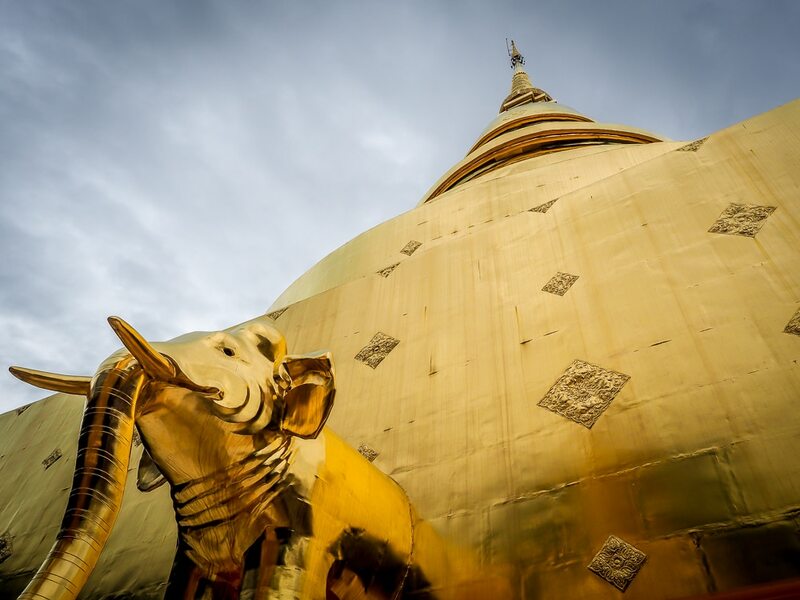 It includes a towering white & gold chedi with a lion at each of the four corners. Who doesn’t like a Big Buddha? You can climb up on top of one side building just below the Big Buddha to get a good view of the chedi. There are fewer tourists (none when I went) than most of the temples in the Old City. From Wat Chiang Man (#4), walk north on Ratchaphakhinai Rd. and exit the Old City. You’ll find it on the other side of the moat. 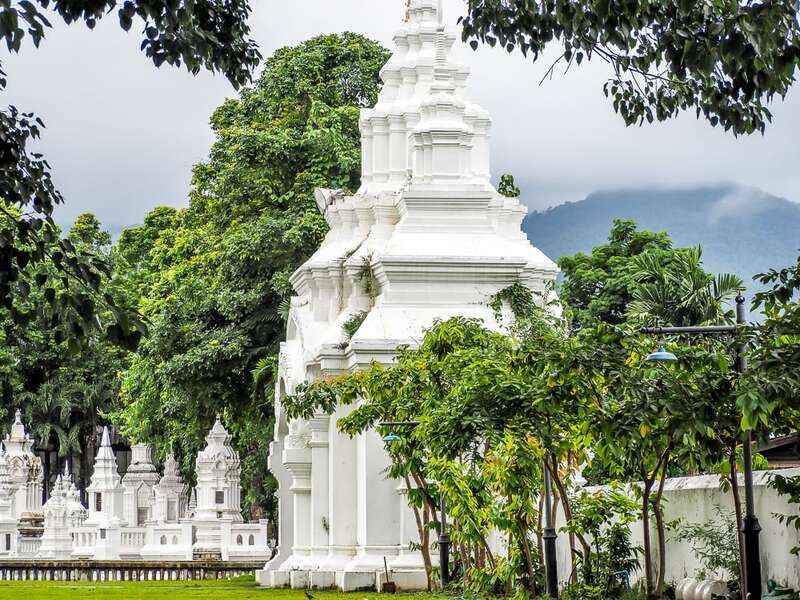 This serene temple complex surrounded by trees and dating to 1613 is named after the unusual shape of its chedi, which supposedly looks like a tower of watermelons. It is important to the local Shan people, who mostly come from Burma. Despite the somewhat long walk to get here and the fact that it was pouring rain when I visited, I liked the quiet, isolated feeling, and the main assembly hall has some gorgeous reliefs and gold work. Be prepared for a 10-15 minute walk from the Old City wall, past the Chiang Mai Stadium. I caught a ride in and walked back to the Old City because it seemed a little tricky to find. On the location of what used to be a royal flower garden, and named after it, the temple is famous for its cluster of white chedis. 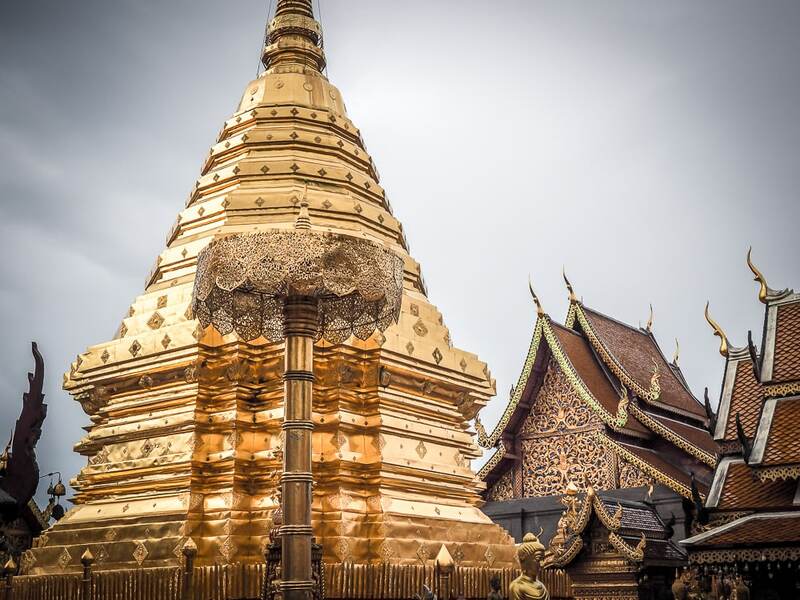 The tallest one is 48 meters high and contains a shoulder bone relic of the Buddha, a piece of which is also enshrined at Wat Phra That Doi Suthep (#12). A king in the 14th century had the temple built to house the relic. When you first arrive, you will immediately be drawn to the collection of white chedis across the large field, and will probably barely pay attention to the enormous assembly hall right next to the road. It’s a surreal experience walking among the white chedis, and if you visit in the early morning or in rainy season like I did, mist or low lying clouds, with the mountains of Doi Suthep in the background, make for an incredible scene. I would say this is definitely one of the best temples in Chiang Mai! 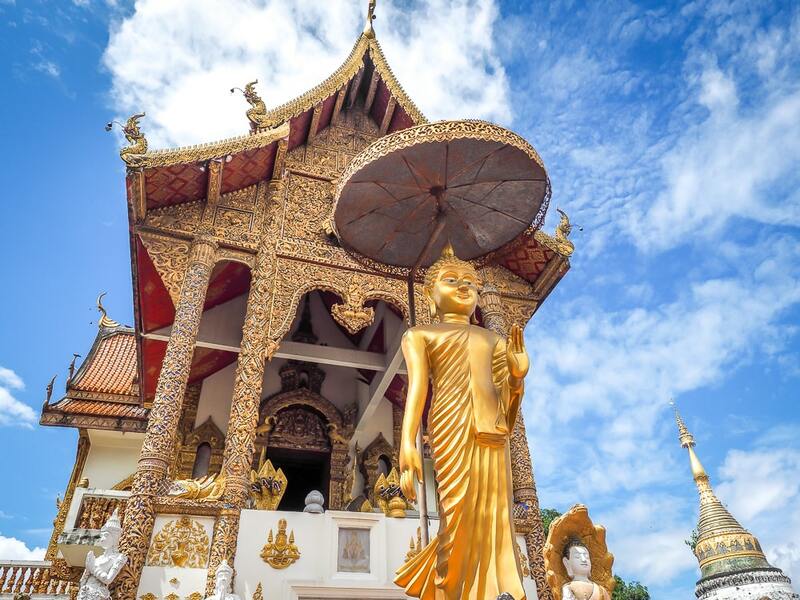 Wat Suan Dok is included on this mindful Chiang Mai temple tour. The temple is located west of the Old City on Suthep Rd., at the southeast corner of sprawling Chiang Mai University. I would suggest getting a ride or cycling here, and it took me quite a while to flag down a taxi after I left, so perhaps have your driver wait for you when you visit if you’re not able to order a ride. 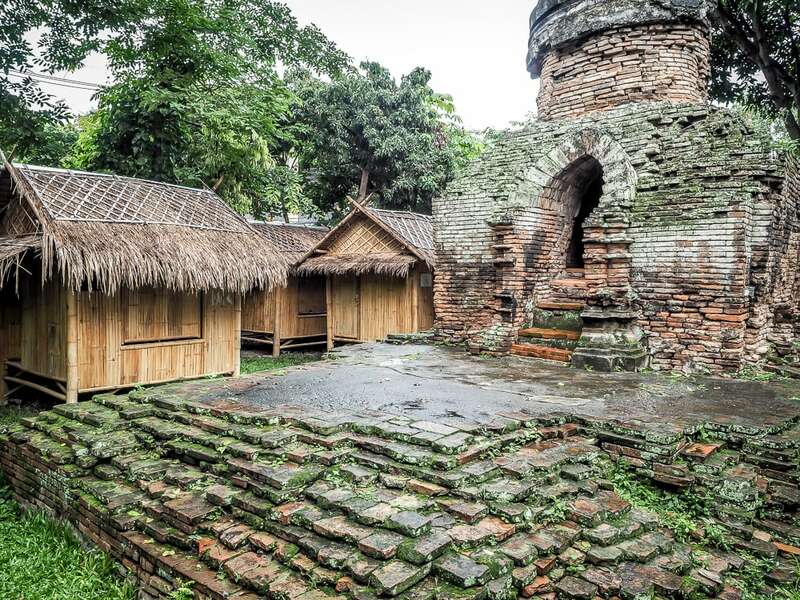 These three temples were financed by Burmese teak merchants and built by Burmese and Shan artisans. Peacocks, standing Buddhas in wall niches, and fine, intricate details are common characteristics of Shan temples. All three of these temples are very pretty, but I especially loved Wat Buppharam, because when I visited I experienced one of those magical moments for travelers or photographers when the light is PERFECT, and this was especially exciting because I was visiting Chiang Mai in the rainy season and had hardly seen the sun in a week. Thanks to this great light, I was able to get the (what I think is a) gorgeous shot, the featured photo at the top of this article. Both this one and the one above were shot at Wat Buppharam in the late morning. The details on Wat Buppharam are so gorgeous that my jaw literally dropped when I first saw it. 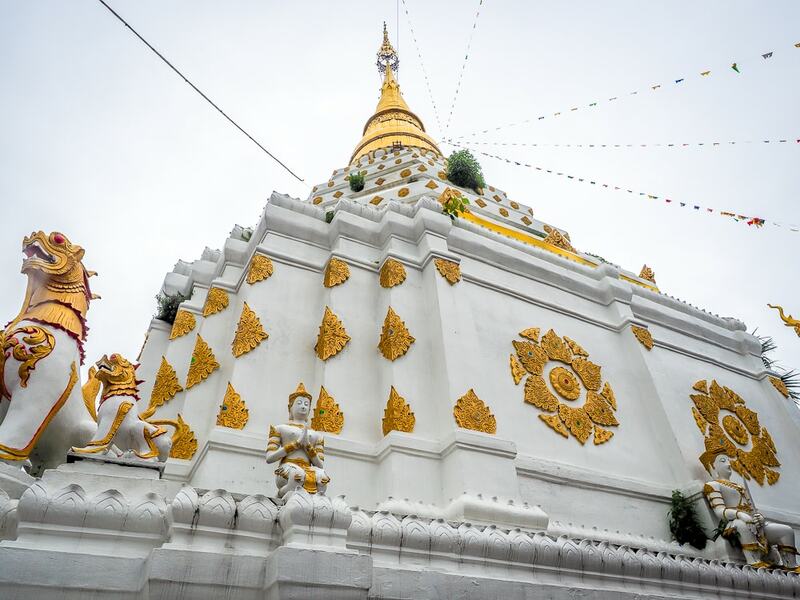 The three temples are conveniently located halfway between Pratu Tha Phae, the Old City’s famous eastern gate, and Wararot Market/Chiang Mai Night Bazaar, all on Tha Phae Rd. Located in an area known for the fine artisanship of its silversmiths, this 500-year old temple is famous for its more recent silver ordination hall, which is actually covered in a combination of silver, nickel, and aluminum. There’s also a silver and gold Ganesh statue under a silver umbrella, a crossover from Hinduism. The fact that it’s a silver temple, of course! But for me, besides the initial “wow” factor, I was actually most impressed by the stunning details in the metalwork on the sides of the hall when viewed up close (see photo below). Like many people, we visited on Saturday so we could also explore the (very touristy) Saturday Walking Street on Wualai street. We popped in to the temple first to see the it in daylight, and again after having dinner in the market to see the temple bathed in lights at night. The alternativing colored lights seemed tacky at the time, but also made for impressive photos. Note that women are not allowed to enter the silver ordination hall. An announcer awkwardly reminded visitors of this every few minutes while we visited. The temple is most easily accessed by taking the small lane that connects it to the Saturday Walking Street on Wualai street. Market stalls line the small lane right to the temple entrance. It’s not the easiest to reach, but if you only visit one temple in Chiang Mai, you should make it Doi Suthep. The temple sits atop Doi Suthep (mountain), in a 261-km2 national park overlooking Chiang Mai. 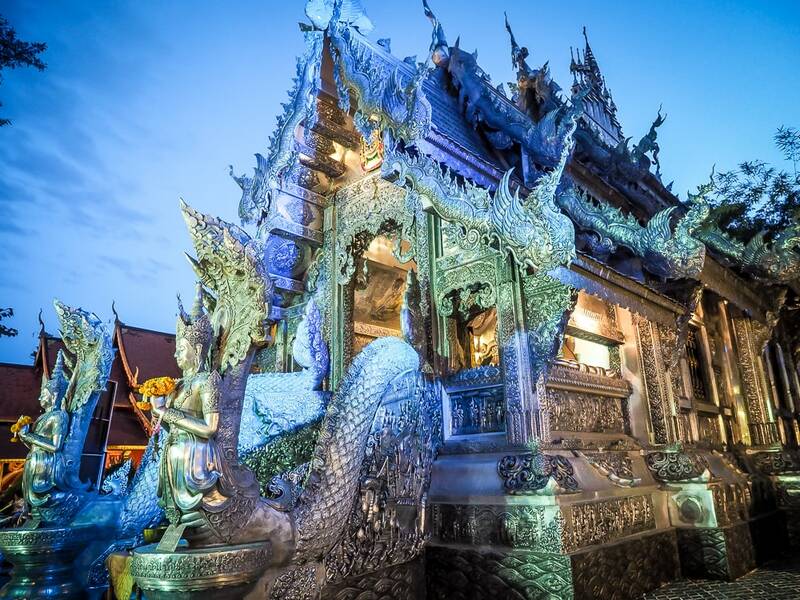 It is an important pilgrimage site and one of the holiest places of worship in all of Thailand. 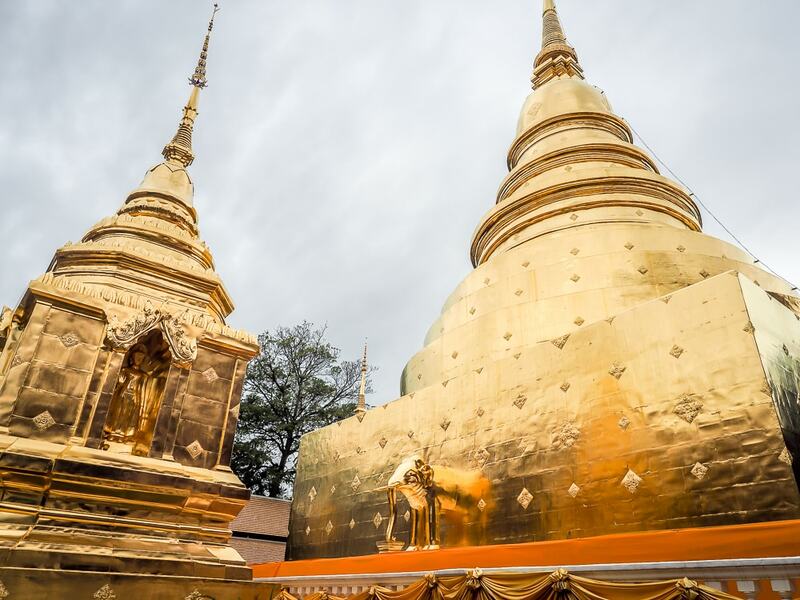 The temple’s golden chedi often catches rays from the sun and can be seen from most places in the city. It houses a piece of the same Buddha relic that is enshrined at Wat Suan Dok (#9). 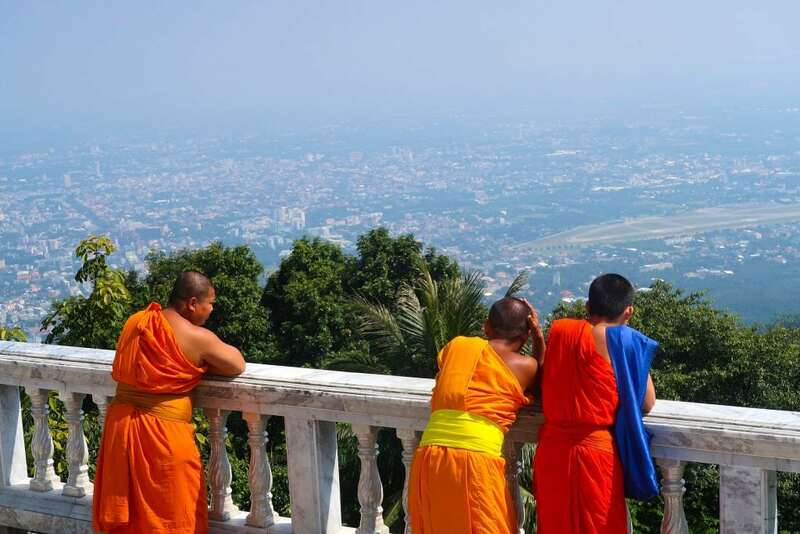 For more information on visiting, including seeing sunrise from the temple, see this beautiful post on Doi Suthep from My Travel Scrapbook, or for another unique take on Doi Suthep, check out this post focused on the beautiful moths at Doi Suthep! Wat Phra That Doi Suthep is included on the Chiang Mai Temple Tour. 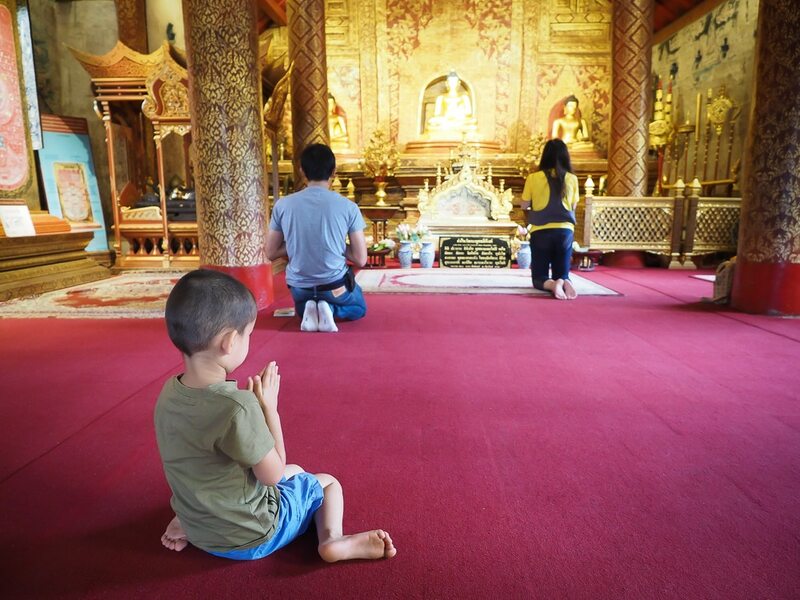 The cultural significance, crowds of devout locals, airy mountaintop location, and panoramic views all make this the (in my opinion) best temple in Chiang Mai. I have a very personal connection to this particular temple. In 2001, at the age of 19, I went backpacking for the first time, and my two friends and I stayed with a local family in Chiang Mai for two weeks. Riding a crowded songthaew up the mountain with Meaw, the Thai exchange student we had first met when she had come to Canada and my friend’s family hosted her, seeing monks walking barefoot carrying their begging bowls, and the temple itself are memories that I will forever cherish, and strongly contributed to my love for Asia, where I live today. I am still friends with Meaw, and on the recent trip when I shot all these photos, some 17 years later, my wife, kids, and I stayed with her again, and spending time in her beautiful home on the outskirts of Chiang Mai was the highlight of our trip. And we visited Doi Suthep together again! Songthaews (50 baht) depart from in front of the Chiang Mai Zoo, or you can charter a songthaew from there or other popular tourist sites like Wat Phra Singh or Wat Chedi Luang. Another option would be to arrange a private driver through your hotel. From the parking lot, there are 309 stairs flanked by two nagas leading up to the temple, or you can squeeze into the electric tram (20 baht per person). 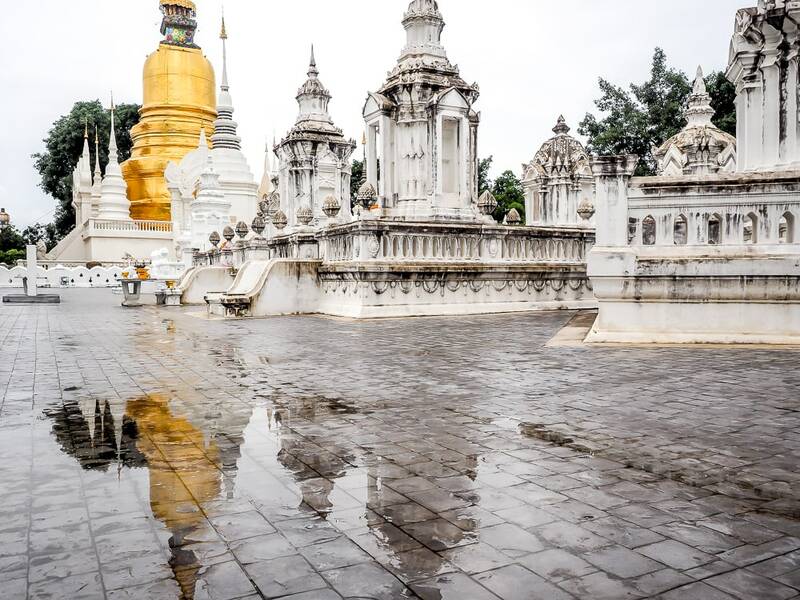 Check out this video I made when we visited Doi Suthep in the rainy season. It was a truly serene experience! Looking down on Chiang Mai from Doi Suthep. The Chiang Mai Airport is visible on the right. 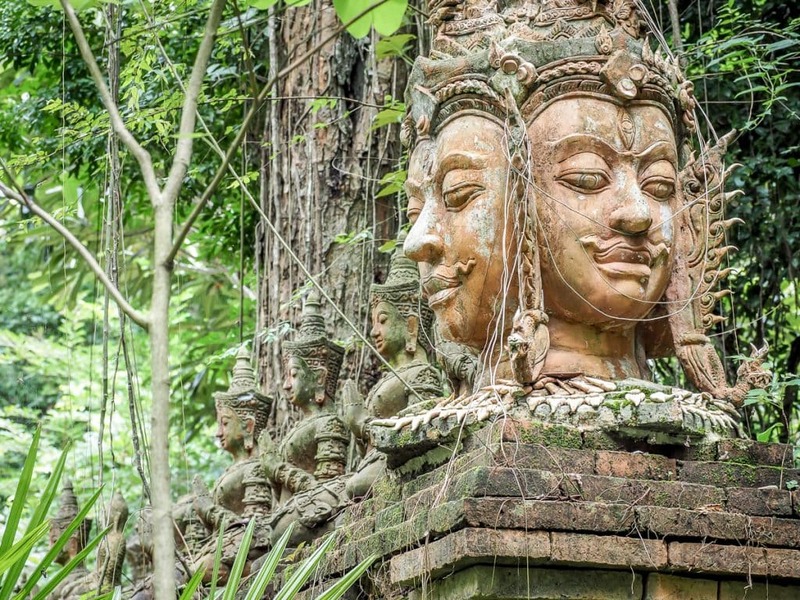 First built in the 14th century, abandoned, and then retored in the 1940s and reestablished in the 1960s, Wat U Mong is a beautiful example of a Thai forest temple. Covering a large area, it includes a collection of tunnels leading to underground shrines below a large platform where the main chedi sits. Along with Doi Suthep, I have vivid memories of coming here during my first visit to Thailand 17 years ago and feeding the large Asian turtles in the large pond. The tunnels are otherworldly and the overall experience is nothing like what you will get at any of the temples in Chiang Mai. You can also see lots of crazy bugs here (hope that doesn’t scare you away)! Furthermore, if you follow Soi U Mong south from the temple, this leafy, winding road is dotted with art galleries, farmer’s markets, and cafés, making it one of Chiang Mai’s coolest up-and-coming neighborhoods, and the kind of place one could easily while away days, weeks, or months, if you have that kind of time. 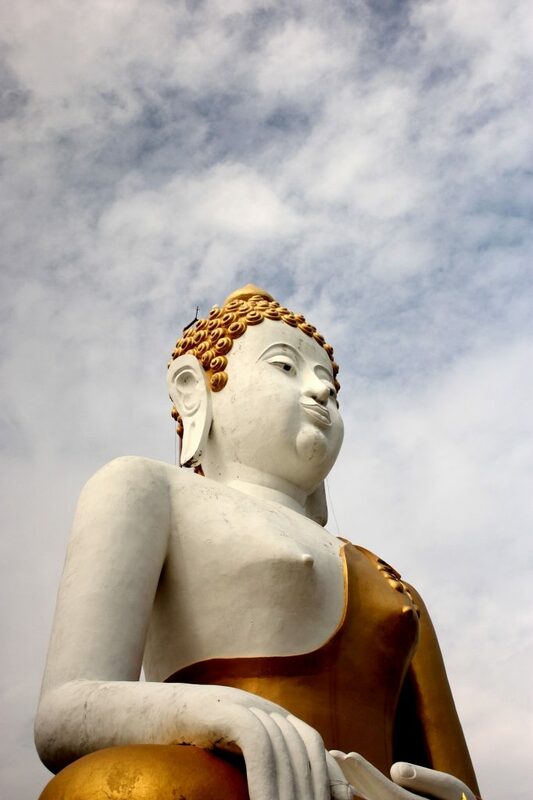 Wat U Mong is included on this mindful Chiang Mai temple tour. You could hire a private driver for about 250 baht each way from the Old City or charter a songthaew for about 100 baht per person each way. 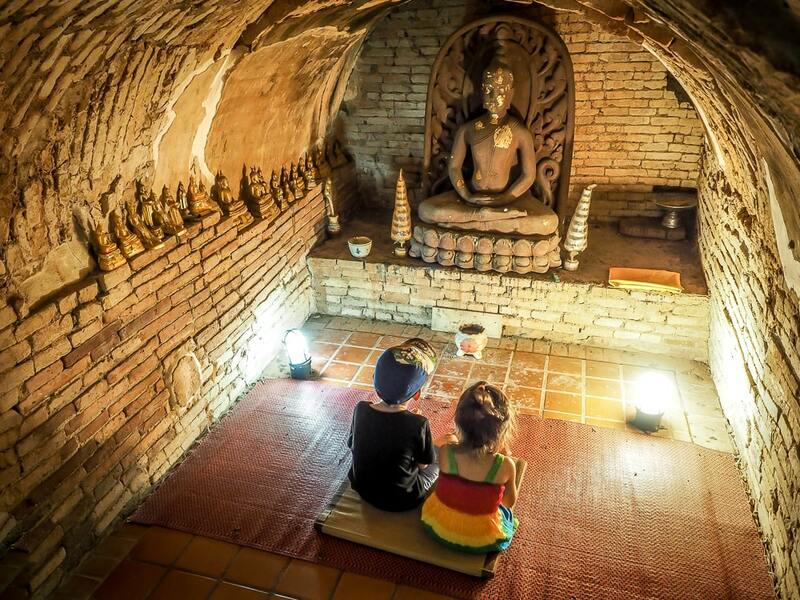 My son Sage and daughter Lavender inside one of Wat U Mong’s tunnel shrines. Sage is praying for new Transformers. Wat Pha Lat started out as a resting spot for pilgrims climbing up to Doi Suthep. Over time it developed into a meditation retreat and monk’s residence. It is about halfway between Chiang Mai University and Doi Suthep, but definitely the walk from behind CMU to Wat Pha Lat is the easier half, while the trail that continues to Doi Suthep attracts only the most devout pilgrims or dedicated hikers. 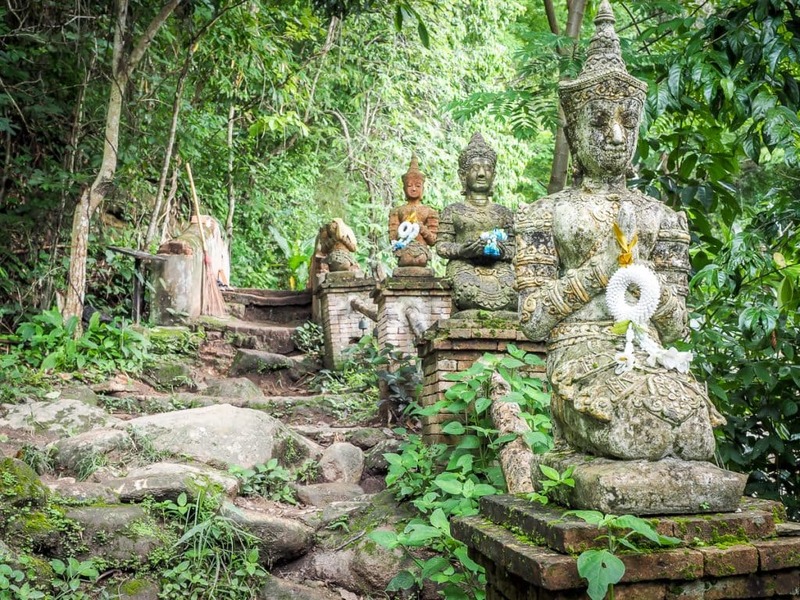 This small temple complex built deep in the jungle atop a waterfall is a truly magical place. 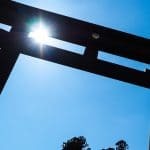 If you hiked up, you’ll hear the sounds of the gushing creek and waterfall before you see the first signs of the temple. Anyone who loves nature, hiking, and secluded places of worship will love Wat Pha Lat. The hike from behind Chiang Mai University takes about 45 minutes from the trailhead. I got dropped off in a taxi at Basecamp Coffee House, an outdoor activity center & coffee shop with attached tom yam noodles restaurant, so I could have breakfast first. It was a 15-minute walk to the trailhead from there, but if you are driving or getting a ride, you can drive right up to the trailhead. See here for more information on how to hike to Wat Pha Lat. This lesser known mountain top temple actually predates Wat Chiang Man (#4), the oldest temple in the Chiang Mai Old City, by several hundred years, with a chedi dating the year 687. Like Doi Suthep, Wat Phra That Doi Kham houses a Buddha relic (this is why they both have “Phra That” in their names), offers sweeping city views, and can be accessed by an (even longer) staircase with nagas on either side, but the Big Buddha makes it different, and the best part is you will see few to no tourists at Wat Phra That Doi Kham. You’ll need to arrange transportation to the base of the mountain, from where you can take a 20-baht songthaew up the winding road or walk up the many stairs. Except to pay around 50% more than for visiting Wat U Mong (#13), and it would be a great idea to visit both of these temples in one trip, since they are at the same end of the city. Thank you for the list, Wat U Mong and Wat Pha Lat look very interesting to explore (and probably less touristy also) 🙂 Going to Chang Mai for 3 days in December, hopefully it is not too busy. Have you been to the golden triangle?